professor, ph.d., Department of Prosthetic Dentistry and Stomatognathic Physiology, University of Turku, Finland and Clinic of Oral Diseases, Turku University Central Hospital. Demographic changes and an increasing number of older adults is a big challenge for the oral health care in all the Nordic countries. The risk for dental diseases increases in older populations because morbidity, and reduced daily functioning and cognition complicate oral hygiene practices and the ability to organise dental visits. Futher, many morbidities and multiple drugs have effects on salivary flow which increases the risk for dental caries. On the other hand, aging itself has effects on the immune system, increasing the severity of periodontitis and the prevalence of oral mucosal diseases, for example. Consequently, dental diseases seem to be concentrating in older age groups. This article aims to provide a comprehensive overview of the unique aspects of dental diseases among older people, emphasizing the occurrence of root caries and periodontal diseases, which are the main dental diseases that typically involve a large number of dentate older people. It also attempts to describe management strategies and highlights minimally invasive treatment concepts for older people. Cumulative gingival recessions in the old people increase the risk of root caries by creating more surfaces at risk and by making these areas more difficult to clean adequately. Minimal intervention dentistry (MID) should be followed to manage dental caries in older adults. Conventional glass ionomer cements (GICs) or resin modified GICs are often the most appropriate filling materials for root caries lesions. Endodontic treatment can be difficult due to obliterated root canals and older patients' limited ability to withstand lengthy appointments. The rationale for maintaining endodontically compromised teeth should be carefully considered. Periodontal diseases can be treated successfully in older patients and periodontal health can be maintained. Non-surgical periodontal therapy may be the only feasible option for older people who cannot maintain proper oral hygiene. The number and proportion of older people is growing fast in all industrialised countries. In future, in many countries, most babies born from 2000 may reach 100 years of age if the annual increase in life expectancy continues (1). For example in Finland in 2010, the proportion of those 65 years old or older was 17.5 % and the corresponding proportion has been predicted to be 28.8 % in 2060 (2). In many western countries the new generations of the older people will be more healthy, more wealthy, better educated and will make greater demands on health services than the older people today. On the other hand, as the number of older people is growing, so also is the number of very old, frail and dependent older people. Oral health needs will be significantly affected by changes in health status, in attitudes and behaviour. Currently, the oral health of older individuals is improving rapidly, and the number of persons who have retained their own teeth is increasing. The WHO recommendation for adequate occlusion, 20 natural teeth, has almost been achieved in Sweden in the oldest age groups (3) but in Finland the oldest age groups have about 10 teeth (4). This article aims to give the reader a comprehensive overview about the features of dental diseases among older people, emphasising the occurrence of root caries and periodontal diseases, which are the main dental diseases typically involving large number of dentate older people. It also attempts to describe management strategies and treatment concepts for older people with different degrees of treatability. Dental caries is an infectious disease caused by acidogenic microorganisms, which dissolve enamel, cementum and dentine. The main risk factors for dental caries among older people are poor oral hygiene, poor diet and hyposalivation (5). There is global trend towards a decrease in untreated caries among children and untreated caries seems to be more prevalent among older populations (6). Globally, there are three peaks in the incidence of caries, at 6, 25 and 70 years, although the incidence and prevalence vary between countries (6). In Finland, the national Health 2011 survey revealed that caries was most common among 75 years old and older age groups. More than half of men and 21 % of women in this age group had at least one tooth with a caries lesion (4). 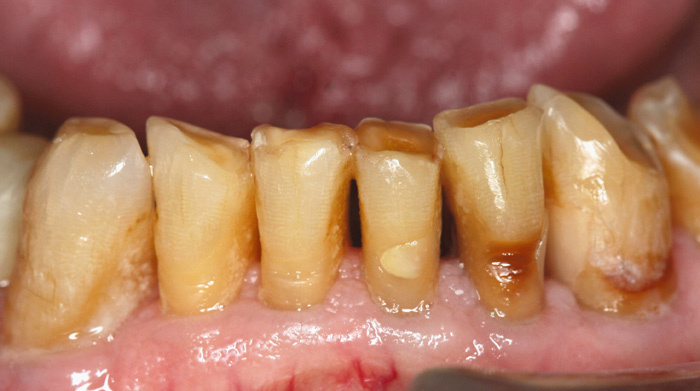 The location of caries lesions is determined by the retention of microbial deposits (7). Kotsanos and Darling (1991) have reported decreasing susceptibility of enamel to artificial caries with age (8). This was explained by the completion of mineralisation of the outer enamel and by a reduction in the permeability of enamel with age. However, the fluoride content of the mid-coronal buccal surface enamel was found to decrease post-eruptively. This latter observation is in accordance with the finding of Kidd et al. (1984), that the abraded enamel of old individuals develops more extensive artificial caries lesions than does the intact enamel of their younger counterparts (9). It thus seems that the risk of developing enamel caries lesions does not decline with age. During aging, the dentine becomes more sclerotic, which diminishes the susceptibility of dentine to dental caries (10). This sclerotic dentine with intra- and inter-hypermineralised dentinal tubules, cannot be etched adequately, which reduces the dentinal seal of composite resins. Preparation of retention grooves into the cavity among older people is needed. As a result of periodontal diseases and attachment loss, gingival recessions become frequent in older people (Fig. 1). Exposed root surfaces are more vulnerable to destruction than is the enamel. The root surface is rough, thus retaining more dental plaque than enamel. Root dentine and cement include less unorganic material but more organic material when compared with enamel. Further, hydroxyapatite cristals in root dentine are clearly smaller and few and far between and therefore root dentine is more vulnerable to acid attack (11). As a consequence, in acid attack, mineral on at the root surface is lost at a higher pH and during a longer time when compared with enamel. Fig. 1. Exposed root surfaces with initial caries lesions on teeth 33 and 32. Dental erosion clearly visible on the incisal surfaces. There is plaque accumulation in the interdental spaces. Primary demineralisation of root exposes collagen fibrils, which can lead to greater breakdown of dentine (12). Root caries lesions usually spread by covering a large surface area rather than penetrating deeply into tooth structure. Circumferential spreading of root surface caries weakens the tooth structure and increases the risk of crown fractures (Fig. 2). Fig. 2. Progressive root caries lesions on teeth 34 and 33. Crown of tooth 32 fractured due to advanced caries. The prevalence of root caries among older people has been high in most studies on older adults (13 - 15), although Henriksen (2004) concluded that caries was a minor problem in older Norwegians (16). In recent studies, root caries lesions have been associated with previous restorations, most notably prosthetic crowns and with decrease in functional ability and cognitive function (14,17). Frequent sugar intake, poor oral hygiene and use of removable partial dentures have been associated with large increases in the risk of root caries (18). Cumulative gingival recession also increases the risk of root caries by creating more surfaces at risk and by making these areas more difficult to clean adequately. Splieth et al. (2004) also confirmed an increase in the root caries index (4.6 - 10.6 %) in a longitudinal study on older people in Germany (19). Shah and Sundram (2004) showed in their study that older urban Indians from higher socio-economic groups had higher proportion of carious teeth (2/3 of their lesions were root caries) than rural older Indians in lower socio-economic and literacy groups, contradicting a previous study in Scandinavian older people (13,20). Fure's (2003) longitudinal study on Swedish older people showed that the incidence of coronal caries decreased, while the incidence of root caries increased with age, with highest increase in the oldest age group (21). Table 1 The principles of minimal intervention dentistry (MID). When cavitation is present and surgical intervention is needed, conservative caries removal is undertaken in order to maximise the repair potential and retain tooth structure. When regonising lifestyle factors, daily oral hygiene practices in order to remove dental biofilm are most important. The frequency of tooth brushing and interdental cleaning and the use of fluoridated tooth paste is ascertained and the outcome of cleaning is evaluated. The timing of diet and the content of diet are also investigated. Saliva tests include measuring stimulated and unstimulated salivary flow rate, evaluating buffer capacity, and evaluation of Streptococcus mutans and Lactobacillus and Candida counts. Brushing the teeth twice a day with fluoridated tooth paste and cleaning interdental spaces once a day is recommended and an electric tooth brush is preferred. The dentist or oral hygienist instructs how to brush the teeth and clean interdental spaces with dental floss or interdental brush efficiently. When the ability to perform these activities daily is reduced, the spouse or a nurse is informed to brush the teeth of the client thoroughly. Plaque discolouration can be used to demonstrate areas of the dentition difficult to clean. The timing of eating is important, and if possible, it is a goal to concentrate consumption of sweet and cariogenic food to meal times. Older people are recommended to eat more frequently than younger persons because older persons are at greater risk of malnutrition. Older persons eat smaller portions and in order to prevent malnutrition, frequent eating is recommended. Thus timing of the meals is based on a case by case evaluation of the overall health situation of every old person. Oral moistening may be needed in order to reduce xerostomic symptoms, and water, saliva substitutes, olive oil and xylitol pastilles are recommended instead of juices and cariogenic pastilles. For non-invasive treatment of root caries, 5000 mg/L fluoride toothpaste or arginine 1,5 % and 1,450 mg/L F are more effective to inactivate root caries lesions than toothpaste including 1,100 - 1,450 mg/L fluoride. Toothpaste including 5,000 mg/L fluoride inactivates 51 % more root caries lesions compared with standard toothpaste and it is recommended for older people (24). In another report, root caries prevention is favoured by 5,000 mg/L fluoride toothpaste, fluoride rinsing with 0.025 - 0.1 % fluoride solutions and application of fluoride varnish or fluoride gel three to four times a year (25). On the other hand, fluoride tablets and fluoride containing chewing gum, toothpicks and dental floss have unfavourable cost effectiveness ratios in root caries prevention (25). In Sweden the National Board of Health and Welfare provides recommendations for prevention of dental caries and the use of fluoride products (26). More comprehensive descriptions about preventive measures have been described in another Nordic Theme article. 1) Tooth substance removal is minimised so that the preparation follows the shape of the caries lesion. Sufficient tissue is removed to allow instrumental and visual access to caries. 2) Demineralised dentine is removed from the periphery of the cavity in order to achieve a marginal bond. 3) A flat cavity floor is not needed. 4) Prepare rounded internal cavity angles, no dovetails or occlusal keys are needed. Small retention slots may be used in order to reduce stress on the bond. Dentine contains significant amounts of water and organic material, which makes adhesive bonding challenging. Bonding to caries-affected dentine becomes even more difficult becauce of its softness and mineral deposits within the dentinal tubules (28). GICs and resin composites are currently used to restore root lesions. GIC is optimal in achieving long-term chemical adhesion to dentine and enamel. This adhesion is achieved by an ion exchange mechanism by which a stable acid resistant "ion exchange layer» is created which prevents bacterial contamination of the dental pulp and microleakage (29,30). Fluoride ion release and uptake associated with the filling materials is particularly advantageous for those with high susceptibility to dental caries. When considering the role of fluoride ion release, it is easy to classify glass ionomer cements as therapeutic restorative materials. There is evidence that GIC restorations may make root surfaces resistant to the cariogenic effects of oral biofilm (31). The disadvantages of GICs include low mechanical resistance and sensitivity to dehydration. Resin-modified GICs were developed to overcome the disadvantages of the conventional GICs, and to increase the number of clinical applications. When compared with conventional cure GICs, the resin-modified materials are generally better in terms of immediate strength and aesthetics, but high polymerisation shrinkage may cause problems with marginal sealing and retention. Due to their advantages, the World Dental Federation (FDI) has recommended the use of conventional and resin modified GICs as materials of choice for the restoration of root caries lesions. It should be borne in mind that recently placed GIC restorations should be protected from dehydration and, on the other hand, from water uptake from saliva by varnish (32). Nowadays, in many third world countries, GICs are used to control caries, e.g. in so-called atraumatic restorative treatment technique (ART). ART technique involves caries removal with hand instruments instead of rotating instruments. The ART technique together with traditional and resin modified GIC as a filling material have shown promising results (33). Good experiences with ART technique indicates that it could be useful in the treatment of older patients with limited or no access to traditional dental offices. 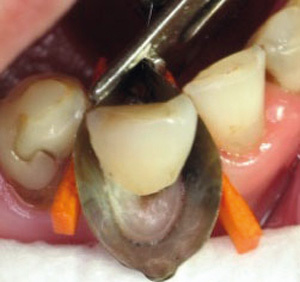 Equal survival rates for GIC restorations have been reported in irradiated patients treated with ART technique and conventional cavity preparation with rotating instruments (34). Less recurrent caries has been reported with conventional GICs compared with composite materials (35). However, McComb et al. (2002) reported higher failure rates for conventional GICs vs. composite resin fillings in compliant fluoride users (36). In terms of restorative materials' erosion, GICs have shown significantly more surface loss when compared with resin modified GICs and composite resin restorations (35). In many cases, root surface restorations extend partly on the enamel surface, which can explain the favourable outcomes for resin composite restorations in some studies (35). Based on the available literature, it appears that in the older people compliant with fluoride advice and good oral hygiene, resin composite restorations would be the most appropriate material. Care should be taken, however, when placing the composite resin restorations. Good access and moisture control are mandatory. This can be achieved by using class V matrices or by placing retraction cord in the periodontal sulcus (Fig. 3). With advancing age and increasing use of medications, oral hygiene is impaired in many elderly patients and it appears that conventional GICs or resin modified GICs may be the most appropriate material for treating root caries lesions (37). Use of a conditioner in the preparation of conventional GIC cavity and varnish on the filling are preferred. Fig. 3. Class V matrix placed for restoring the root surface. The appropriateness of preserving a tooth should be carefully considered prior the endodontic treatment. The decision-making process should be guided by the strategic importance of the tooth. It may be important for preserving an intact dental arch, for providing retention for removable prostheses, for retaining fixed dental prostheses, for the maintenance of reduced dentition in a shortened dental arch, for retaining a root supported over-denture or for preserving the bone. Costs of the treatment should also be considered (38). Older people's healing response to high quality root canal treatment is as good as in younger individuals (39). However, often the biggest challenge in the endodontic treatment involves the duration of the appointment. Dementia and tremor, as in patients with Parkinson's disease, may lead to poor compliance with the treatment, which can be a contraindication for endodontic intervention. Circumferential spreading of root caries lesions weakens the tooth structure significantly. In many cases, only a narrow dentine bridge connects the crown of a tooth to the root, which is surrounded by sound bony structure. This can make root canal treatment difficult or even impossible, as good access to root canals requires sufficient preparation of coronal dentin. In older people, root canals are usually partly obliterated by the formation of secondary or reparative dentin and even opening the root canal can be challenging (Fig. 4). Open root canals are usually found deep in the root, which complicates the search for the canal opening and can prolong the treatment session. Pulp fibrosis is usually present in old root canals, which makes it less sensitive and difficult to confirm pulp vitality. Many endodontic diseases arise without an elderly patient being aware of them (40). Fig. 4. Advanced carious lesion on tooth 26. Endodontic treatment is compromised due to obliterated root canals. Besides opening the obliterated root canals, the big obstacle to endodontic treatment can be older patients' ability to open the mouth sufficiently for canal instrumentation or for placement of the rubber dam (38). Periodontal diseases are common among older persons. According to the Health 2011 Survey in Finland, the prevalence of periodontal diseases, measured by having at least one deepened periodontal pocket, was highest among 75+ year old persons; 85 % among men and 71 % among women in this age group (4). In Sweden, the prevalence of periodontitis in the age group of 81 years older, determined by having at least two periodontal pockets of 5mm or more, was 29 % in women and 36 % in men. The most severe periodontitis was in the oldest men. Thus, severe periodontal conditions seem to concentrate in the older age groups (41). Preservation of periodontal health is important for older patients. Periodontal infection and inflammations are likely to impair oral function and reduce quality of life and periodontal disease related low graded systemic inflammation increases a patient's risk of developing severe chronic systemic diseases. Periodontal disease has been associated with morbidities, such as diabetes, cardiovascular disease, asthma, COPD, pneumonia, rheumatoid arthritis, kidney disease and dementia (42). Treatment of periodontal infection has been shown to improve the glycaemic control in diabetes (43), decrease CRP (44) and improve endothelial function (44). It has been shown that older people develop more gingivitis than young subjects in the absence of oral hygiene (Holm-Pedersen et al. 1975 (45), Fransson et al. 1996 (46)) but no difference was observed in the rate of gingival healing after beginning oral hygiene (Holm-Pedersen et al. 1975 (45)). Dental plaque formation was the same in the old and in younger subjects (Fransson et al. 1996 (46)). A decreased host response to plaque microorganisms with advancing age has been suggested to lead to increased inflammatory reaction in the gingivae of the old adults (47). Thus, good oral hygiene is especially important for the dentate older people, but despite their good cleaning efforts, it is often inadequate (48). Frequent periodontal maintenance treatments that can be performed by a dental hygienists should be part of older adults' oral health care programs. The effects of chronic conditions, illnesses and medications on the ability of the older patients to accept treatment must be understood if periodontal care is to have a reasonable chance of success. Non-surgical periodontal therapy may be the only feasible option for old people who cannot maintain proper oral hygiene. It must be born in mind that periodontal diseases per se can be treated successfully in the aged and periodontal health can be maintained (49). The main principles in the treatment of dental diseases among older people include (Modified from Størksen, 2001(50) by A-M S): 1) Management of pain; 2) Treatment of oral infections such as gingivitis, periodontitis, dental caries, endodontic infections and oral mucosal infections; 3) Instruction to the patient or caregiver or nurse about adequate oral hygiene and preventive methods; 4) Performing restorative and prosthetic treatment. The overall primary aim is to maintain good oral health related quality of life and the ability to eat as well as possible. Some contents of the management strategies may not be applicable in all Nordic countries due to national regimes or restrictions. Frail older persons have decreased immunity, so the dentist should consider antibiotic prophylaxis for periodontal treatment and dental extractions. Antibiotic prophylaxis should also be used for those taking immunosuppressive drugs, such as methotrexate, denosumabi, biological anti-rheumatic drugs and also for those with diseases which impair immunity, such as diabetes, congestive heart failure, malignancies and hepatic and renal diseases. Older people with good treatability are those who live at home and have good physical and cognitive health. If oral hygiene is good, older persons can be treated just like younger persons. The periodontal hygienic phase is the basic treatment for all older people. When treatability is good, subgingival microbial samples with adjunct antimicrobial therapy and occlusal adjustment, periodontal surgery and implant surgery are possible. Good oral hygiene and a commitment to maintenance care are needed when periodontal or implant surgery are planned. Low dose doxicyclin therapy may also be used to reduce periodontal inflammation in most susceptible persons. Caries risk factors have to be determined (poor oral hygiene, diet, hyposalivation) and those risk factors must be eliminated or reduced. Incipient lesions are arrested by toothpaste including 5000 mg/L F and adequate oral hygiene instructions must be provided. Electric toothbrushes and diet counselling are recommended and regular recall appointments should be organised. Xerostomia symptoms can be relieved by water, saliva substitutes, olive oil and xylitol lozenges. All restorative materials can be used with the basic principle of preserving tooth structure as much as possible. If there is dental plaque on root surfaces, glass ionomer cement and sometimes even amalgam are preferred to composites as filling material for root caries. Amalgam is often the best filling material to endure saliva and blood in challenging marginal and subgingival cavities. However, in some countries, for example in Sweden, the use of amalgam is forbidden. Endodontic and prosthetic treatments are possible for older people with good treatability. When the treatability is moderate, daily functioning is decreased due to cognitive and physical morbidities and medications. These older persons live at home with the aid of spouse or nurse or they live in sheltered homes. The risks for poor periodontal conditions entail susceptibility to periodontal disease, diabetes, poor oral hygiene and lack of maintenance care. In such cases, a periodontal hygiene phase is planned and, if there are 6mm or deeper periodontal pockets after the periodontal hygiene phase, repeated instrumentation is undertaken. No periodontal surgery is undertaken for these older people. Without good healing, 6mm or deeper bleeding periodontal pockets have a poor prognosis and extraction may be preferred. Furcation involvements with 4 - 5 mm horizontal attachment loss can be treated successfully by maintenance care with ultrasonic tips, if moderately good oral hygiene can be maintained. 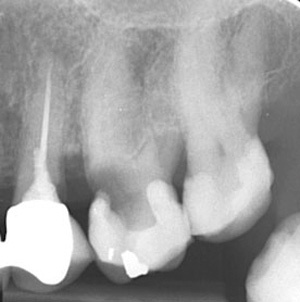 More severe attachment loss in furcation areas indicates tooth extraction. In cases of moderate treatability, caries risk factors include poor oral hygiene and hyposalivation. The diet may also be cariogenic. Because oral hygiene may be poor, glass ionomer cement and even amalgam are preferred to composites as filling material for root caries. These older persons need help with daily oral hygiene practices and a spouse or a nurse may help to maintain oral hygiene with an electric toothbrush, dental floss or interdental brush. Toothpaste including 5,000 mg/L F, diet counselling and elimination of xerostomia symptoms are advised. Regular recall appointments should be organised. Periapical infections indicate extractions. Adapting to new dental prosthesis may be impossible. Therefore, rebasing previous dental prosthesis and duplicate dentures are preferred. Treatability is poor or extremely poor when daily functioning is severely decreased due to cognitive and physical morbidities and medications. Such older persons live in sheltered homes or nursing homes. Then, self-performed oral hygiene may be poor, with the nurse maintaining oral hygiene. The risks of poor periodontal conditions are diabetes, poor oral hygiene and lack of maintenance care. The risk factors for dental caries may be low saliva secretion due to the many drugs used, and poor oral hygiene. Diet may also include cariogenic items. Education of nurses to perform daily oral hygiene practices and use of 5,000 mg/L F toothpaste is needed. Lack of co-operation in oral hygiene practices may be a problem. The aim is to treat oral pain, oral infections, gingivitis, periodontitis and dental caries as well as possible. Further, the aim is to preserve the dentition without any new dental carious lesions and to arrest incipient carious lesions, prevent dental pain, arrest periodontal attachment loss and gingival inflammation and maintain the ability to eat. Altogether the aim is to maintain oral health related quality of life as well as possible. Restorative treatment and the periodontal hygiene phase may be possible using oral sedatives. GIC and/or amalgam are preferred as filling materials for root caries. In cases of teeth with severe periodontal disease and periapical infections, extraction is to be preferred. But in risk patients, for example those very frail, or immune-compromised, using bisphosphonates, anticoagulants and having endocarditis, extraction may not be an option and antibiotics and analgesics are used as symptomatic care. Mashed food with vitamin and energy supplements are needed if the older person has poor masticatory function such as few or no natural teeth and do not adapt to use dental prostheses. Demografiske ændringer og et stigende antal af ældre voksne er en stor udfordring for tand- og mundsundhed i alle de nordiske lande. Risikoen for tandsygdomme stiger i aldrende befolkninger på grund af morbiditet, og nedgang i daglig funktionsevne og kognitive evner komplicerer mundhygiejne og evnen til at organisere besøg hos tandlægen. Desuden påvirker mange sygdomme og forskellige typer medicin spytafsondring, der øger risikoen for dental caries. På den anden side påvirker selve aldringsprocessen immunsystemet og øger alvoren af fx marginal parodontitis og forekomsten af slimhindesygdomme i munden. Derfor synes mund- og tandsygdomme at forværres i de ældre befolkningsgrupper. Denne artikel har til formål at give et omfattende overblik over de unikke aspekter af mund- og tandsygdomme blandt de ældre med fokus på forekomsten af rodcaries og marginal parodontitis, der er de primære tandsygdomme, der typisk rammer et stort antal af ældre med egne tænder. Der gøres også et forsøg på at beskrive håndteringsstrategier og fremhæve minimalt invasive behandlingsmuligheder for de ældre. Christensen K, Doblhammer G, Rau R et al. Ageing populations: the challenges ahead. Lancet. 2009; 374: 1196 - 1208. Edman K, Öhrn K, Nordström B et al. Trends over 30 years in the prevalence and severity of alveolar bone loss and the influence of smoking and socio-economic factors - based on epidemiological surveys in Sweden 1983 - 2013. Int J Dent Hyg. 2015; 13: 283 - 91. Suominen L, Vehkalahti M, Knuuttila M. Suun terveys. In: Health, Functional Capacity and Welfare in Finland in 2011. Koskinen S, Lundqvist A, Ristiluoma R, eds. National Institute for Health and Welfare (THL), Report 68/2012. Helsinki 2012.
de Mata C, McKenna G, Burke FM. Caries and the older patient. Dent Update 2011; 38: 376 - 8. Fejerskov O, Nyvad B. Pathology and treatment of dental caries in the aging individual. In: Holm-Pedersen P, Löe H, eds. Geriatric dentistry. Copenhagen: Munksgaard, 1986; 238 - 62. Kotsanos N, Darling AI. Influence of posteruptive age of enamel on its susceptibility to artificial caries. Caries Res. 1991; 25: 241 - 50. Kidd EA, Richards A, Thylstrup A et al. The susceptibility of 'young' and 'old' human enamel to artificial caries in vitro. Caries Res. 1984; 18: 226 - 30. Ketterl W. Age-induced changes in the teeth and their attachment apparatus. Int Dent J. 1983; 33: 262 - 71. Fure S. Karies hos äldre. Tandläkartidningen 2001; 93: 42 - 50. Wefel J, Clarkson BH, Heilman JR. Natural root caries: a histologic and microradiographic evaluation. J Oral Pathol. 1985; 14: 615 - 23. Shah N, Sundram K.R. Impact of Socio-demographic variables, oral hygiene practices, oral habits and diet on dental caries experience of Indian elderly: a community-based study. Gerodontology. 2004; 21: 43 - 50. Morse DE, Holm-Pedersen P, Holm-Pedersen J et al. Prosthetic crowns and other clinical risk indicators of caries among old-old Swedish adults: findings from the KEOHS Project. Kungsholmen Elders Oral Health Study. Gerodontology. 2002; 19: 73 - 9. Mack F, Mojon P, Budtz-Jørgensen E et al. Caries and periodontal disease of the elderly in Pomerania, Germany: results of the Study of Health in Pomerania. Gerodontology. 2004; 21: 27 - 36. Henriksen BM, Ambjornsen E, Axéll T. Dental caries among the elderly in Norway. Acta Odontol Scand. 2004; 62: 75 - 81. Avlund K, Holm-Pedersen P, Morse DE et al. Tooth loss and caries prevalence in very old Swedish people: the relationship to cognitive function and functional ability. Gerodontology. 2004; 21: 17 - 26. Steele JG, Sheiham A, Marcenes W et al. Clinical and behavioural risk indicators for root caries in older people. Gerodontology. 2001; 18: 95 - 101. Splieth Ch, Schwahn Ch, Bernhardt O et al. Prevalence and distribution of root caries in Pomerania, North-East Germany. Caries Res. 2004; 38: 333 - 40. Palmqvist S, Soderfeldt B, Vigild M et al. Dental conditions in middle-aged and older people in Denmark and Sweden: a comparative study of the influence of socioeconomic and attitudinal factors. Acta Odontol Scand. 2000; 58: 113 - 8. Fure S. Ten-Year Incidence of Tooth Loss and Dental Caries in Elderly Swedish Individuals. Caries Research. 2003; 37: 462 - 9. Allen E, da Mata C, McKenna G et al. Minimal intervention dentistry and older patients. Part 1: Risk assessment and caries prevention. Dent Update. 2014; 41: 406 - 8. Brostek AM, Walsh LJ. Minimal intervention dentistry in general practice.Oral Health Dent Manag. 2014; 13: 285 - 94. Petersson LG. The role of fluoride in the preventive management of dentin hypersensitivity and root caries. Clin Oral Investig. 2013; 17(Supp 1): S63 - 71. Walsh LJ, Brostek AM. Minimum intervention dentistry principles and objectives. Aust Dent J. 2013; 58(Supp 1): 3 - 16. Predigo J. Dentin bonding-variables related to the clinical situation and the substrate treatment. Dent Mater. 2010; 26: e24 - 37.
ten Cate JM, van Duinen RN. Hypermineralization of dentinal lesions adjacent to glass-ionomer cement restorations. J Dent Res. 1995; 74: 1266 - 71. Tyas MJ, Burrow MF. Adhesive restorative materials: a review. Aust Dent J. 2004; 49: 112 - 21. Yip HK, Guo J, Wong WH. Protection offered by root-surface restorative materials against biofilm challenge. J Dent Res. 2007; 86: 431 - 5. Davidson CL. Advances in glass-ionomer cements. J Appl Oral Sci. 2006; 14 (Supp): 3 - 9. Lo EC, Luo Y, Tan HP et al. ART and conventional root restorations in elders after 12 months. J Dent Res. 2006; 85: 929 - 32. Hu JY, Li YQ, Smales RJ et al. Radiation-induced root surface caries restored with glass-ionomer cement placed in conventional and ART cavity preparations: result at two years. Aust Dent J. 2005; 50: 186 - 90. De Moor RJG, Stassen IG, van't Veldt Y et al. Two-year clinical performance of glass ionomer and resin composite restorations in xerostomic head- and nec-irradiated cancer patients. Clin Oral Investig. 2011; 15: 31 - 8. McComb D, Erickson RL, Maxymiw WG et al. A clinical comparison of glass ionomer, resin modified glass ionomer and resin composite restorations in the treatment of cervical caries in xerostoic head and neck radiation patients. Oper Dent. 2002; 27: 430 - 7. Amer RS, Kolker JL. Restoration of root surface caries in vulnerable elderly patients: a review of the literature. Spec Care Dent. 2013; 33: 141 - 9. Allen PF, Whitworth JM. Endodontic considerations in the elderly. Gerodontology. 2004: 21; 185 - 94. Friedman S. Prognosis of initial endodontic therapy. Endod Topics. 2002; 2: 59 - 88. Michaelson PL, Holland GR. Is pulpitis painful? Int Endod J. 2002: 35; 829 - 32. Renvert S, Persson RE, Persson GR. Tooth loss and periodontitis in older individuals: results from the Swedish National Study on Aging and Care. J Periodontol. 2013; 84: 1134 - 44. Otomo-Corgel J, Pucher JJ, Rethman MP et al. State of the science: chronic periodontitis and systemic health. J Evid Based Dent Pract. 2012; 12(3 Supp): 20 - 8. Chapple IL, Genco R; working group 2 of the joint EFP/AAP workshop. Diabetes and periodontal diseases: consensus report of the Joint EFP/AAP Workshop on Periodontitis and Systemic Diseases. J Periodontol. 2013; 40(Supp 14): S106 - 12 . Tonetti MS, Van Dyke TE; Working group 1 of the joint EFP/AAP workshop. Periodontitis and atherosclerotic cardiovascular disease: consensus report of the Joint EFP/AAP Workshop on Periodontitis and Systemic Diseases. J Clin Periodontol. 2013; 84 (4 Supp): S24 - 9. Holm-Pedersen P, Agerbaek N, Theilade E. Experimental gingivitis in young and elderly individuals. J Clin Periodontol. 1975; 2: 14 - 24. Fransson C, Berglundh T, Lindhe J.The effect of age on the development of gingivitis. Clinical, microbiological and histological findings. J Clin Periodontol. 1996; 23: 379 - 85. Page RC. Periodontal disease in the elderly: A critical evaluation of current information. Gerodontology. 1984; 3: 63 - 70. Artnik B, Premik M, Zaletel-Kragelj L. Population groups at high risk for poor oral self care: the basis for oral health promotion. Int J Public Health. 2008; 53: 195 - 203. Holm-Pedersen P. Periodontal treatment and prophylaxis in the frail elderly. Int Dent J. 1991: 44(4); 225 - 32. Størksen K. When standard solutions do not exist. The treatment choices of the sick elderly. Finn Dent J. 2001; 5: 269 - 76. Ghezzi EM, Ship JA. Dementia and oral health. Oral Surg Oral Med Oral Pathol Oral Radiol Endod. 2000; 89: 2 - 5.